When I was first diagnosed with multiple sclerosis I wanted to go to war with it I wanted to fight it tooth and nail fist and foot. The problem was I had no idea of how-what-where and when to actually start my one man crusade against a disease that attacked from the inside out. Which I believe is probably how most men react to finding out they have MS because, let’s face it, men are from Mars ruled by the God of war according to the Greeks and you can’t beat something and get the desired results by just sulking about it. And in my opinion this is how most men start their MS journey, or at least, I did. And though I am not a woman I have observed over my many years since being diagnosed, that women seem much more likely to be devastated at first by this disease on an emotional level, even more so then on a physical level, like I believe most men are, because women just can’t emotionally come to grips with MS on a sensitivity level when it doesn’t fit in at all on any nurturing path that most women are used to dealing with in their normal daily lives. And women probably skip right past the, why me, and go straight to the, why anyone, question, where as men get stuck on the why me before realizing that this disease is an equal opportunity destroyer. And men and women also seem to differ on how they start to cope with this ghostly health shadow that will follow them around just beneath their daily life persona for the rest of their natural born days. Women, being from Venus the planet of love, seek out others to share their inner most feelings with about this rude uninvited guest that decided to crash their own personal space as they wonder: How do I tell the kids? Men, after finally realizing that the fight was over before it even began, want to take the flight option and just go find a cave to be alone in while they try and work through all the details of their future and how they are going to adjust from this sneak attack from within that came without any rules or warning as they wonder: How is this going to effect my work? At this point men start to look for the solutions to answer all of the problems that they now fear they will have to face. Women, on the other hand, search out people to share their feelings with, and then how to define all of the problems that they will eventually have to face. This is a very difficult point in the disease progression especially for men, who will almost always see and fear the worst. While women are much more likely to seek out and accept empathy and sympathy and hope for the best. And most men, unfortunately, see empathy and sympathy as a sign of weakness and surrender from their own personal ego driven point of view. Sorry ladies, that’s truly a guy thing. In the end women probably have an easier time accepting multiple sclerosis as a part of their lives then men do, though at some point, even men have to grudgingly surrender to their deepest fears and let this invisible monster become a part of their existence. And it is only then that men become much better communicators with just about everyone because having an incurable disease is a great educator/dictator when it comes to learning what empathy and sympathy really mean and how to share them with the world around you. It’s a tough lesson to learn, and a lesson that has been truly an awakening for me. I just wish I knew how to pass it on to a world that desperately needs to learn the true meaning of compassion, because that’s exactly what having MS or any incurable disease teaches you, compassion! 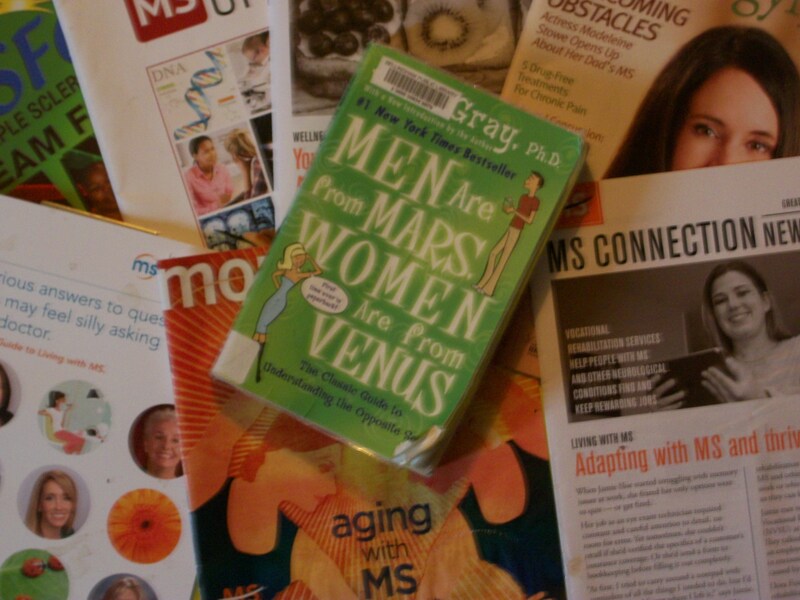 This entry was posted in MS and Bill Walker, The Spiritual Side of MS, Uncatagorized and tagged Incurable Diseases, Mars God of War, Men are from Mars Women are from Venus, MS, Multiple Sclerosis, Venus Goddess of Love on October 19, 2015 by msandbeyond.